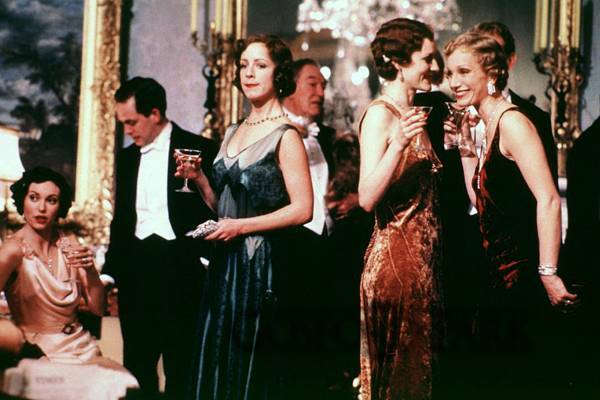 Gosford Park, the new film by Robert Altman, is, on the surface, about the murder of an aristocrat at an English mansion in the countryside. Beneath the surface, it hopes to be a satire on the English class system of 70 years ago. Truth be told, it’s just a decent mystery filled with excellent British character actors, reminiscent of the Charlie Chan films one of its characters produces. The film begins with Kelly MacDonald as Mary Macreachran, maid to Constance, Countess of Trentham waiting in the rain by a Rolls Royce. Constance, played delightfully by Maggie Smith, walks out and into the car, showing not a care that Mary is soaked. As they drive, Constance can’t figure out how to open her thermos of tea, forcing the car to be pulled over so Mary can open it for her. It’s a not so clever way of establishing the ingratitude and helplessness of the British upper-classes during the period between the wars. They soon arrive at Gosford Park for a weekend shooting party. A large string of characters is introduced, aristocrats and servants, upstairs and downstairs. Michael Gambon’s Sir William McCordle is hosting the party along with his wife Sylvia played by Kirstin Scott Thomas. Downstairs, Helen Mirren’s Mrs. Wilson, Eileen Atkins’s Mrs. Croft, and Alan Bates’s Jennings run the show as Housekeeper, Cook, and Butler respectfully. Problems and relations romantic and financial are soon revealed within both groups and between them, setting the stage for Sir William’s murder and its aftermath. Altman has received much praise for this film, notably in the form of the Best Director prize for 2001 from the American Film Institute, New York Film Critics Circle, and National Society of Film Critics. Seeing Gosford Park, I cannot but feel it is undeserved. First, it outright steals the shooting scene from Jean Renoir’s The Rules of the Game. Second, it has managed to nod to almost everything good British director Joseph Losey ever did. Third, the film’s satire is all too obvious and anyone who has read the novels of Evelyn Waugh or P.G. Wodehouse, or for that matter seen PBS’s wonderful adaptation of Wodehouse’s Jeeves and Wooster stories, will know what good satire of the British upper class is. As for the mystery, anyone who has read half an Agatha Christie novel will have solved the mystery by 30 minutes in. But Gosford Park is rescued by the fill of its many fine performances. Now, if you gave a dog the cast assembled here, it would make a good film. This is not to say Altman has the directorial talent of a mind the size of a small potato. Rather, just that it didn’t take much IQ to direct this picture, considering the acting talent involved. Of note are Gambon’s performance, which isn’t much on paper or in dialogue but is much more in his gruff manner and gluttonous bulk; Emily Watson’s housemaid, whose strength and heart shine through her weariness; and Helen Mirren’s housekeeper, whose posture and face show off her unemotional and robotic servant manner, much like Anthony Hopkins in Remains of the Day. But the most praise goes to Clive Owen’s Robert Parks and Kelly MacDonald’s aforementioned Mary Macreachran. Owen’s talent is masculine and mesmerizing. When 20 characters are presented on screen, one wants to know only what he’s doing. MacDonald has the difficult responsibility of holding the movie together as amateur detective. She projects youth and innocence but never naiveté and always intelligence. Since first appearing in Trainspotting she has never quite come into her own. With this performance, however, she proves her talent. Hopefully others will take notice. To be honest, almost every performance has something good in it, from Richard E. Grant’s devilish footman to Bob Balaban’s neurotic Morris Weissman, the producer of Charlie Chan films. With a better script and better direction, something truly exceptional could have come about, perhaps even a classic. Instead a halfheartedly made film has been served up as art, great only in comparison to the Hollywood trash that surrounds it in the theater.